The foundation to your wardrobe can be stylish and in doing so it can make you feel absolutely fabulous! I don't know about you, but - for me - undergarments that are pretty, match and hopefully comfortable will rock even the plainest of clothes. In honor of Breast Cancer Awareness (the month of October honors this battle) this stylish brazier is fun and easy to create. Using Punch-Art your hand-stamped card will honor all those who have faced the struggle of Breast Cancer or know those who have. Create a stunning, feminine hand-stamped card when you add lace! Not only lace but pink lace that is elegant and covers the whole card! The I Love Lace background stamp is just lovely. 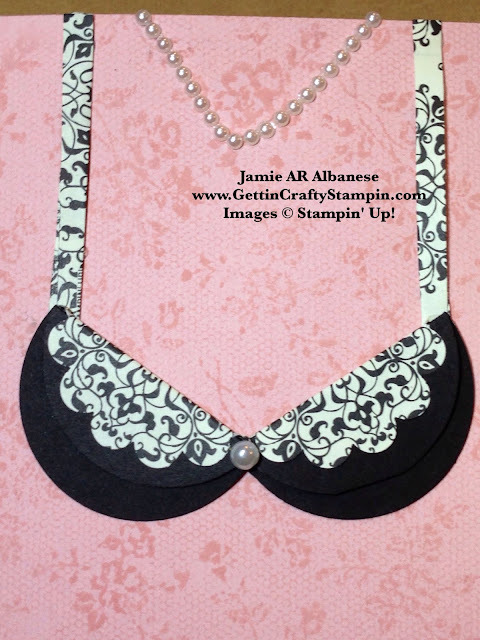 Create this tone on tone card with the large rubber-stamp in Blushing Bride ink on the Blushing Bride card stock. Punch the Basic Black card stock with the 1-3/4" Circle Punch. Score at the 1/4 mark using the Stampin' Trimmer. This will create a 'cup'. Adhere the flap down with Glue Dots. Punch the 1-3/4" Scallop Punch in this pretty Typeset Designer Series paper (a favorite collection of mine). Score this 1/3 in and adhere wrapped around the cup using the Glue Dots. Cut a 1/2" Strip of the Typeset Designer Series Paper and score 1/2 way down - creating these 'straps'. Adhere using the glue dots. Add feminine pretty accents using the adhesive backed Pearl Jewels (they come in a variety of sizes and even have these connected lines - creating a pearl necklace). 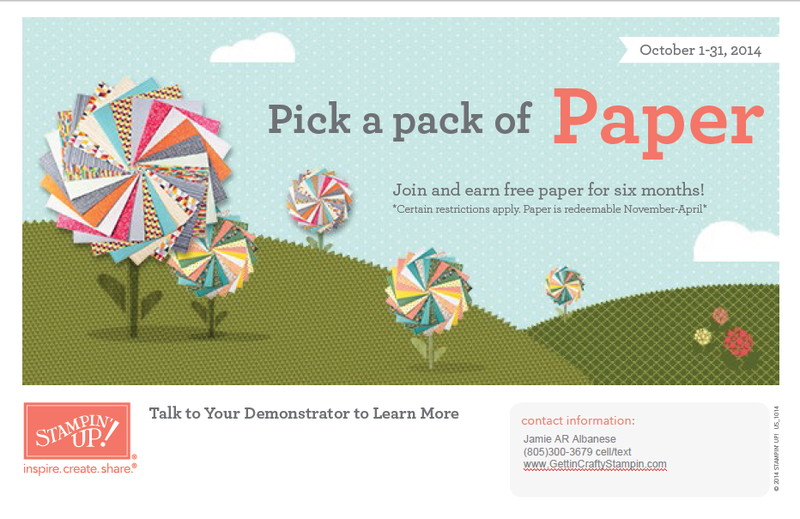 See MORE on this AMAZING Special of 6 Packs of FREE Designer Series Paper when you Click HERE! Did you know.... Breast Cancer can be defeated if found early! Men and Women, young and old can get Breast Cancer. ALL ORDERS PLACED Using this Code, at check out, ( N2NF2HC4 ) will go donate 10% of all Net Sales to Support Breast Cancer and the American Cancer Society! BONUS - I will send you a hand-stamped, punch-art card like this in thanks for your support... good foundation is all about support! The foundation to your wardrobe can be something that makes your whole outfit - in the way it makes you feel. A must for good support - honoring the Bra is a simple and elegant way to also pay homage to the Breast Cancer Awareness month. I actually met my husband at a bra designing and manufacturing company - he was the Controller and I was the Executive Assistant to the CEO... so, I understand the beauty and value that a pretty foundation can give. Deliver hope, support and love in a pretty, feminine, elegant hand-stamped, punch-art card that pays homage to Breast Cancer Awarness and the brave battle these women and men face. All purchases this month, using this hostess code ( N2NF2HC4 ), will have a donation to the American Cancer Society and Breast Cancer Research and will receive a Breast Cancer Support card (like this) sent to you - thanks for your Support!